Corneal Refractive Therapy - Jensen Optometrists, P.L.L.C. CRT uses uniquely designed contact lenses to reshape the cornea reducing your need for glasses or contacts. Rigid contact lenses have been used for many years, with varying success, to reshape the cornea and reduce nearsightedness. CRT is a new fitting method that provides more predictable results. CRT is effective, non-invasive, and reversible. No long-term negative side effects were found in the Food and Drug Administration (FDA) clinical studies. WHO WOULD BENEFIT FROM CRT? Patients who want an effective, predictable, non-invasive, and reversible procedure. Patients who are averse to laser vision correction. Young patients that are not good candidates for refractive surgery. Nearsighted patients with corrections less than -6.00 and have less than -1.00 of astigmatism. Patients interested in a more economical alternative to laser vision correction. Patients who want to be free of glasses or contact lenses during daily life. WHO CAN FIT ME WITH CRT LENSES? Dr. Clark Jensen has been certified in CRT since March of 2001. Dr. Whitney Jensen began fitting CRT lenses in optometry school and became certified in 2015. Dr. Clark has successfully fit more CRT patients than any other practitioner in the state. He has gained valuable experience as he has helped Paragon refine their fitting system and fitting sets. 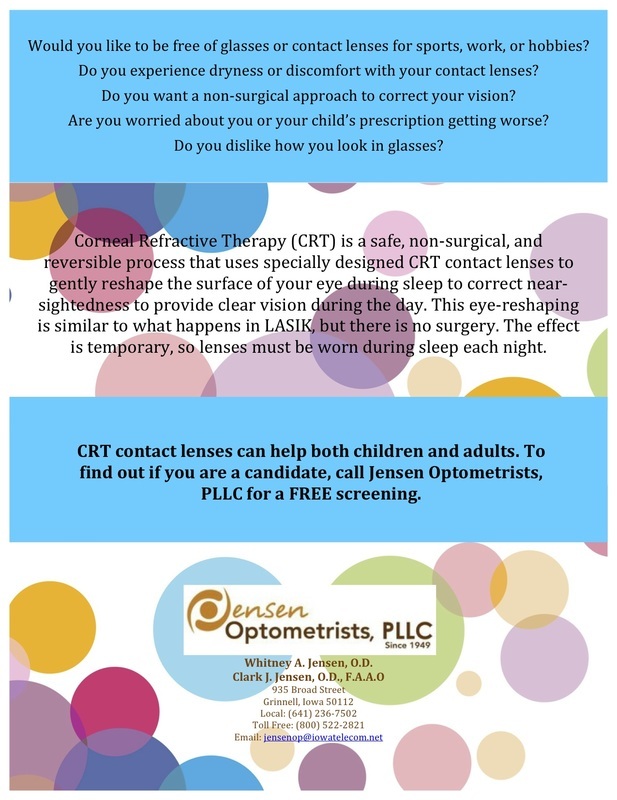 He is involved with CRT on a national level by being a board member and treasurer of the American Society of Corneal and Refractive Technologies (ASCRT). ﻿﻿"I have had tremendous success with CRT. CRT is great for sports, and water activities. You don't have to worry about your contacts drying out or falling out during school." "I just wanted to thank you for not giving up on my goal and dreams of not having to wear glasses. You worked very hard, switching my lenses so that I am able to see without glasses. It still amazes me that a contact could and did correct my vision." "The reason I like CRT is the fact that I don't have to wear glasses all day long. I only wear my CRT lenses seven to eight hours a night and I am good to go the next day. I especially like them in the summer because I think glasses are hot and always seem to be getting smudged up. For someone who doesn't want to worry about the risks with LASIK, this is a great way to go." "I use to get eye infections all the time from wearing my contacts too long. But, now with CRT I can stay up late studying and hanging out with my friends and still see clearly-infection free!"